PCUSA STATEMENT ON U.S HOSTILITIES AGAINST RUSSIA. 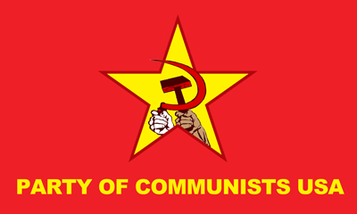 The Party of Communists USA (PCUSA) condemns militarist efforts to isolate and harass Russia. U.S. imperialism continues to ramp up its hostility to Russia, to a point where, informed observers believe the U.S. and Russia are closer to war now more than since the overthrow of socialism in the U.S.S.R. in the early Nineties. Some even assess the hostilities to be greater than at any time since the end of World War II. The hysterical accusations grow wilder each time: Russia is accused of having shot down a Malaysian passenger jet, duped U.S. voters into electing Donald Trump, and poisoned an ex-spy, all without evidence. The reality is that Russia earned the U.S. ruling class's eternal hatred by blocking imperialism's attempt to overthrow the patriotic government of Syria. Independent Syria stands in the way of the U.S., and Saudi plans to control all pipeline access to the Middle East's oil. Russia furthermore enraged the U.S. war mongers by retaking Crimea from the U.S. puppet regime in Ukraine and supporting armed resistance to Ukrainian fascists by the Russian-speaking peoples of Donetsk and Luhansk. Russia's willingness and ability to defend its own national sovereignty and self-determination, and to directly involve itself militarily in the struggle of other nations oppressed by imperialism, mark it for everescalating attacks by the U.S. and its NATO vassals such as Britain. U.S. imperialism hopes to dissuade Russia from coming to the defense of Iran when Iran is attacked, as the U.S. and Israel have already agreed to do by secret agreement. The PCUSA supports the struggle of the international working class and all peace-loving forces to oppose the belligerent schemes of U.S. imperialism, including imperialist threats against Russia. We stand in solidarity with the anti-imperialist forces fighting for national sovereignty and selfdetermination.